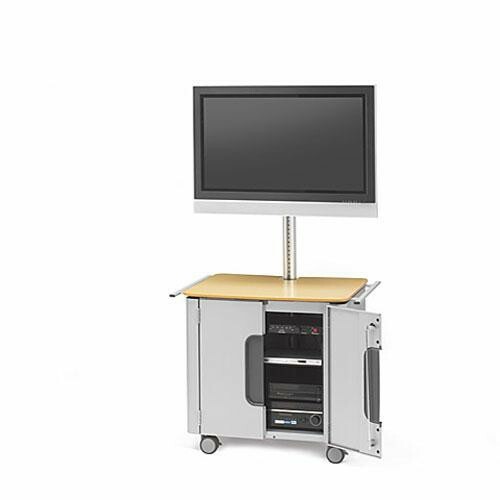 The Bretford FPPC72V200 Large Flat Panel Monitor Cart allows you to easily display and move a large flat monitor and a 19" rack mount system between rooms and events. Width and height adjustable universal mounting arms fit the mounting hole pattern on most 32 - 50" flat panel monitors up to 170 lbs. The adjustable arms feature a 0-15° forward tilt adjustment, and allow you to rotate the monitor from landscape to portrait format and back with the touch of a finger. The FPPC72V200 has a lower steel cabinet that is finished in Aluminum paint and features a laminate top shelf. The cabinet interior includes 19" rack mount rails with 16 unit spacing, two 19" rack-compatable accessory shelves, and extra space to accommodate a CPU tower. A convection venting design allows warm air to escape from the top of the cabinet while drawing cool air up through the base to cool electronic equipment. The front and rear doors of the cabinet secure with keyed locks. The sturdy 72" high aluminum pole features mounting holes 1" apart that span the entire length for easy height adjustment of your monitor. These mounting holes also allow the addition of optional accessories, such as shelving and speaker bars. Front and back cord management channels plus adjustable cord management clips keep your power and data cables neat. Four 4" twin wheel casters (all lock) and two handles allow easy transport from one location to another. Please note that your monitor must have a mounting hole pattern no larger than 700mm wide by 400mm high to use this cart. A universal mounting bracket supports most 32 - 50" flat panel monitors up to 170 lbs.